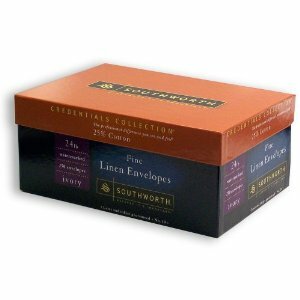 Southworth Fine Linen Envelopes - 25% Cotton gives your documents that 'something extra'. Make sure you have that 'something extra' in your envelopes as well. Lovely linen finish. 25% Cotton, #10 size, Watermarked. 24 LB, White, 250 Envelopes per box. 55% Recycled content with 30% Post-Consumer fiber.